Check out Hertz Furniture's collection of partitions & cubicles. For temporary space arrangements, choose from our variety of styles and sizes for your school or office. For more permanent solutions, we offer built-in options so they are always there when you need them. 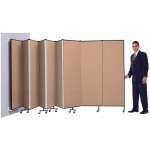 So which commercial room dividers should you get? You should get something that fits your space and will last many years. No matter which type of partition suits your space, all are simple to set up and fold closed with ease. Constructed from high-quality materials, our cubicles are sturdy and long-lasting. In addition, Hertz Furniture offers a complimentary planning and design service to help you make the right purchase. What length room dividers do I need? 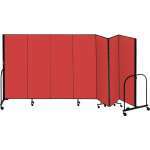 Freestanding room dividers come in a huge selection of lengths. This arrangement enables you to choose the configuration that fits your space perfectly. Longer options are great if you need to divide a large room into separate areas. Shorter configurations are perfect for sectioning off small areas. Why should you get partitions? Room dividers save money while making the most of your space. Rather than undertaking a costly construction project, a portable partition can quickly create a new space. Instead of spending months waiting for your room to be ready and back in use, you can divide your space in a matter of minutes. If you decide you want an alternate arrangement, you can simply rearrange the partitions again. How should I choose partitions? There are various benefits to different arrangement options. Slimmer panels are good for tighter turns. Sound absorbing options are ideal for many settings, especially classrooms and offices. Many partitions have surfaces you can hang posters or important information on using tacks or velcro, so you won&t need to find an appropriately-sized bulletin board for displaying information in a newly-divided room. Mobile display towers offer an excellent way to divide up an open space while exhibiting student projects, pictures of recent church events or community announcements. 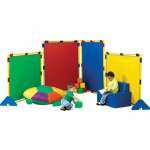 Their tackable surfaces accommodate a variety of hanging options including staples and velcro. Display panels can be rolled into the hallway or lobby to display science fair posters and student announcements, and rolled back into storage when they are not needed anymore. Individual panels are available for dividing up smaller spaces. Wood Designs offers freestanding single divider panels with fun surface options. These choices make the panels themselves into additional activity centers for preschool, daycare or elementary school classrooms. For school use or office use, room dividers are also available with chalkboard or whiteboard surfaces, or built-in cabinets. Which dividers are best for large spaces? For a more permanent setup in larger public spaces, wall-mounted dividers are an excellent option. The floor-to-ceiling panels create the feeling of permanent walls, with the advantage of being able to remove them when you want a larger or more open space. If you still need an easy way to go between sectioned off areas, door panel options are available. There are two different styles of partitions for wall-mounted floor-to-ceiling divisions. Accordion partitions are designed for public areas in schools, offices and places of worship. They minimize air and sound passing between divided sections, so the spaces really feel like separate rooms. Wall-mounted panel partitions are available as well. Full-length wall-mounted panels require custom arrangements in order to ensure that they are arranged and installed correctly. Why should I get office cubicles? When offices are separated by full walls and doors, co-workers are less likely to go into other people&apos;s personal spaces. When a physical wall is placed between professionals, it is much easier for them to build personal and emotional walls. While productivity is always desirable, isolation in personal work areas can limit the flow of ideas. Although having everyone in completely separate spaces may not be ideal, a totally open work area is not great either. If many professionals are trying to focus, make phone calls and meet deadlines, it can be quite distracting to have everyone else in their line of vision. To find a balance between an open and collaborative workspace and a quiet rigorous environment, you need a way to create personal space that is approachable. Dividing a large shared professional space into appropriate personal sections is easy with office cubicles from Hertz Furniture. If you just need a simple way to split a space in half, you can order individual panels to create your own arrangement. However, when something more complicated is required, feel free to take advantage of our custom solutions. What kind of cubicles should I get for my company? Verse Panels from HON are easy to arrange, so you can set up a workspace quickly and independently. They connect in a simple yet sturdy manner, so rearranging is no big deal either. Adjustable glides compensate for uneven flooring, so panels remain stable. HON cubicle walls can be ordered in H or C configurations for long rows of workspaces in a large area. They are available in a variety of sizes so you can choose the perfect fit for any space. With many sizes, you have the ability to provide each individual with exactly as much room as they need. 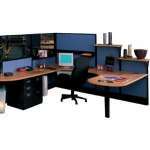 What kinds of cubicles will look nice in the office? When you are looking for a truly upscale, custom layout, Maxon modular office cubicles are the way to go. Their fully-tackable panels can be configured in unlimited arrangements. Fully-slotted panels accommodate built-in work surfaces and enable adjustments. With this setup, each individual can set their cubicle desk at their ideal height. It also saves money because you don&apos;t have to order separate desks for each space. Making sure that regular office desks will fit in the spaces you create can be quite a challenge, but with built-in work surfaces, you get a perfect fit every time. Maxon cubicle arrangements are made-to-order so you get exactly what you need, no matter what your space looks like. When you contact Hertz Furniture, we will create a custom layout for you that is based on your sketches of the space. For fully-enclosed cubicles, you can choose between sliding and hinged doors. A snapfit electrical system facilitates easy cable routing. Hertz Furniture offers partitions and cubicles from leading manufacturers including Screenflex, HON, Customfold and Wood Designs. With a huge selection of sizes and styles, you can find the perfect arrangement for dividing up any space. Whether you are looking to separate spaces in a cafeteria, office, gym, classroom or social hall, Hertz Furniture has a number of options that will meet your needs. Many of our models come with a complimentary extended warranty for years of guaranteed functionality.